To see pictures of Ilya's children, click here. To see pictures of Mendel's children, click here. To see pictures of Zalmon's children, click here. Ilya was the oldest son. 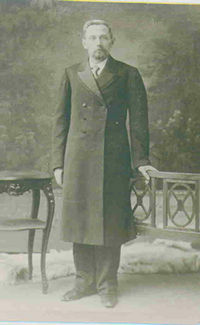 He was born in Glukhov and married Lyuba Krasovitzky in 1878. They had eight children. Abram b.1879, Etta b.1880, Liya b.1883, Leyb b.1884, Israel Noach b.1887, Semyon b.1890, Fanya b.1894, Chaya b.1897. Ilya built up the candy manufacturing business in Glukhov. After his death in 1917 many members of his family left Glukhov and settled in Kharkov. 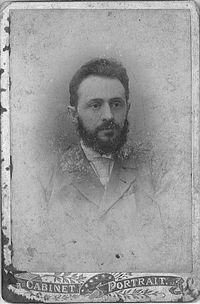 Israel was born circa 1863 in Glukhov. He married and had four known children: Faina, Nusa, another daughter and Semyon who died in Kiev in 1974. Mendel was a "high quality" merchant in Glukhov and was an owner of the candy factory. He also owned a big house, a good deal of property and even had a maid in the house.. Mendel and Sara had 16 children,13 boys and 3 girls. By the time they moved to Kharkov, 1917-18, after the revolution, only six children were alive: Ilya, Semyon, Yakov, Samuel, Leah and Fanya. Mendel was known to be a very kind and generous person who tried to help everyone. The Zavelsky family had been wealthy in Glukhov, but after the revolution all was lost. Mendel died in 1924 in Kharkov after a long illness. During W.W.II, when the family was evacuated to the Urals, Sara refused to go and was killed in Kharkov. Zalmon Zavelsky, known in America as Solomon Sovel, my grandfather was the youngest child of Aron and Charna Zavelsky. He was born in Glukhov in 1871. 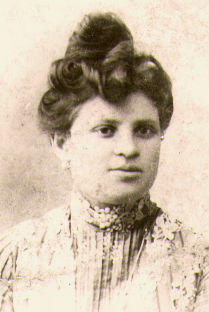 He married Manya (Machla Feiga) Chazanov in Odessa in 1901. Manya was born in Nezhin and moved with her family to Odessa when she was a child. This was most likely an arranged marriage. Their first two children Wolf (lewis) and Lazer were born in Odessa. 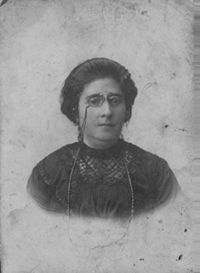 In 1904 the family immigrated to America and settled in Philadelphia where Manya's brother was living. Click here to see the story of their immigration and Manya's return to Odessa. Use your browser's back button to return here. Solomon and Manya had two more children in America, Freda and Harry. The family was raised in Philadelphia. 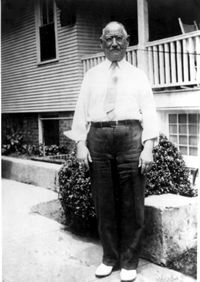 Solomon sold insurance for Metropolitan Life Insurance Company and also assisted his wife in her mens furnishing store. Solomon was a quiet and very gentle man who like many in the Zavelsky family was led by a strong wife. He died in 1943 at the home of his son Lewis. Click here to view Sovel Ffamily Cemetery Plot. 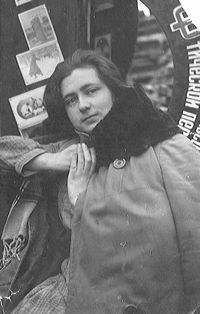 #9...Leah Zavelskaya, daughter of Mendel, who was called Elena Markovna was born in Glukhov in 1908. In 1928 she married Peter Ballo in Kharkov where their daughter was born in 1931. In the early 30's they moved to Odessa because of Peter's work in the military. Peter was in the Soviet army before the W.W.II. He was killed at the front in 1945. Leah and her daughter Julia were evacuated to the Urals during the war. After, they returned to Odessa. It was through records in the Odessa Address Bureau, that we were able to trace Julia in St. Petersburg. It was through Julia that we discovered most of the Zavelsky family in Ukraine. Leah died at the home of her daughter in St. Petersburg in 1991.Click here to read our diary excerpts on our visit with Julia. 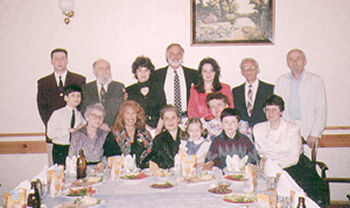 #10...Our reunion with the Kharkov family descendants of Mendel in 1995. All except two people in this photograph have immigrated to Israel or the United States since it was taken. #11...Zalmon Zavelsky 1871 - 1943, son of Aron Moishe, and his wife Manya Chazanov. The photo of Manya was her wedding picture. #15...Manya Sovel with her family. 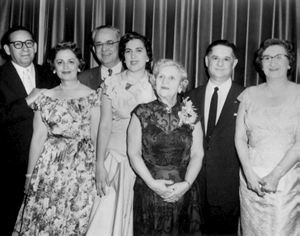 From left to right: Oscar and Freda Leventhal, Harry and Vera Sovel, Manya, Lewis and Rose Sovel in 1956.